So you've had your photography experience, and hopefully you had fun and are looking forward to seeing your pics! 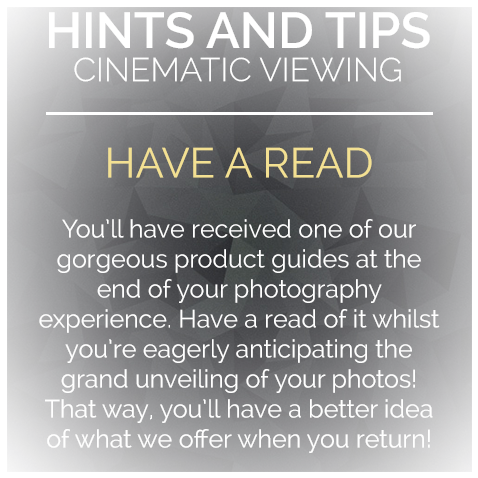 We found that a lot of our amazing customers didn't actually know what to expect from their Cinematic Viewing so we created this page to ease some of the worries and nerves and put you in the loop as to what you can enjoy when you return to see the finished article! In the week or so between your photoshoot experience and your Cinematic Viewing, your photographer will be working on cleaning up any blemishes or imperfections in the backgrounds/sets, brightening up the photographs to give them that stunning finish! Once your photographs have been given the perfect finish that they deserve, you'll get to be the star - as we'll create a bespoke slideshow - just for you! 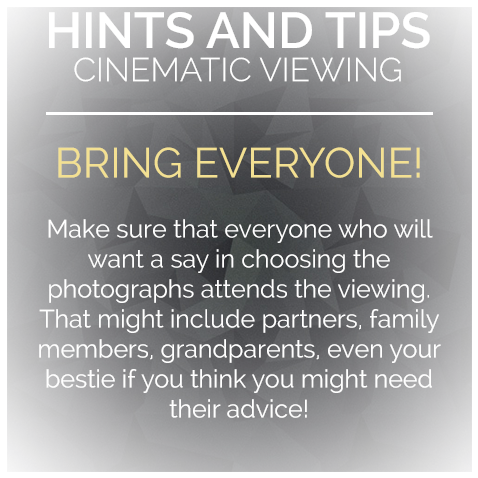 These provide the perfect opportunity to see all the beautiful photographs from your shoot on our stunning projector! When you're in the comfortable, airy Family Viewing suite you're sure to be taken aback as you see the results of your photoshoot on the big screen! Your slideshow will contain a selection of colour and black & white versions of your photographs to ensure that whatever style you prefer, you get a feel for the different effects. Once you've seen your photographs in all their splendor, then comes the hard bit...choosing your favourites! Your expert Viewing Consultant will be on hand throughout to answer any questions and help you place your order. Whether you've prepaid for the whole lot or you have one or two prints to pick, this is your opportunity to choose which you'd like. Of course, most of our customers find it just too difficult to choose, so they end up choosing from our range of great value products and packages on top of what they already have, but, as you'll see in our Facebook reviews - there's no pressure, if you fall in love with more than your voucher, prize or invitation entitles you to your Viewing Consultant will be happy to help! If you'd like to check out the range of products we offer, as well as the prices, we've provided a handy link for you to take a look at! If you do fall in love with any more you're welcome to take advantage of our flexible INTEREST-FREE finance option! For just a 25% deposit on the day, you can pay the remainder over 10 months at no extra cost. If you'd like to take advantage of this fab offer you'll need your debit card for the Direct Debit and one other form of identification - choose from a UK driving license (provisional or full), alternative credit/debit card or bank statement. Check out what some of our customers thought of their experiences, we love to hear their feedback and hope it helps you get an idea of how our luxury photoshoot experiences work too!